There’s a scene around forty minutes into Philip Ridley’s cult feature debut in which a boy sees a man fellating a petrol pump before striking a match to his gasoline-covered body. The boy, Seth (Jeremy Cooper), doesn’t seem to entirely comprehend what’s happening, but he is both deeply unnerved and utterly transfixed. This is fairly analogous to the experience of watching The Reflecting Skin (1990), an uncanny work of overwrought American Gothica which harvests horror from the yellow glow of Midwestern cornfields. The approach to the threshold into adolescence has rarely comes in as eerie a package. The “nightmare of childhood” is how Seth’s neighbour, the unearthly Dolphin Blue (Lindsay Duncan) refers to it, but it is arguably more of a child’s nightmare of adulthood and eventual death. Seth is perennially seduced and terrified by maturity and the bizarre world that grown ups around him inhabit, albeit not for long. The narrative remains elusive with regards to the veracity and structure of what is happening, with Seth arguably running through the the landscapes of his own imagination as often as those of Idaho. One thing is for certain: threats lurk in the form of the older people around him: an aggressive matriarch; a father accused of paedophilia and murder; a brother with a short-fuse. Not to mention the possibility that Dolphin is a vampire, or the mysterious black Cadillac cruising shark-like around the plain, carrying a troupe of leather-clad youths like the Danny Zucos of grim reaperdom. Whether or not that Cadillac is responsible for a spate of deaths – or is even actually there – is a topic ripe for debate, but real or not, it acts as a harbinger of doom while playing to Seth’s sense of fear and awe. The James Dean image that the possibly nefarious driver strikes is one of numerous nods to the decay of America. Viggo Mortensen plays Seth’s older brother, returning home from military service, but casting away the stars and stripes when Seth meets him wrapped in a flag. The setting itself, usually a bastion of traditional values, is undercut by moral corruption – but then the viewer is always mindful of how much of what is being seen is reality. 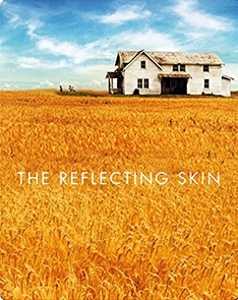 The Reflecting Skin exists in a striking and feverish limbo, a hypnopompic state of unrest. Dark undertones remain excluded from the lush visuals, which carry a burnished quality throughout, sometimes verging on blown out as the camera glides across the corn. The atmosphere is created with the jarring confluence of a vivid technicolor palette and the meticulously choreographed cinematography. At once full of foreboding via off-kilter and low-angle compositions, it equally radiates beauty. The over-done colours also mirror the strange performances, that occupy a space between tortured, amused and vindictive. Even the likes of Mortensen and Duncan are found chewing the scenery – or perhaps the corn – while the viewer is left to whether they’re open to hopping into the cadillac and going along for the ride.